Anywhere. Any Device. Any event. Time is the only non-renewable resource. STiLETTO will free up hundreds of work hours per year to let you focus on what matters. 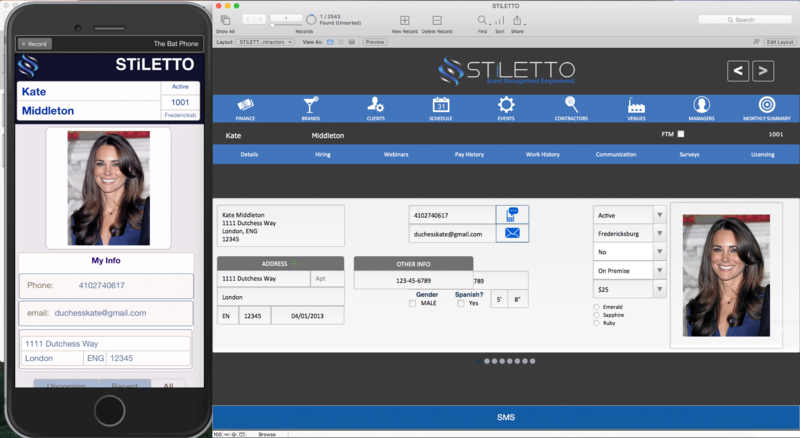 STiLETTO works on Mac, PC, or iOS devices. You don't need a ton of training to jump in and get your business rolling fast. In fact, you'll be amazed at how quickly you'll be up and running. You'll know everything about an event from a simple, clean dashboard. Bottle Sales, photos, recaps, signatures, ratings, surveys, pricing and much more. All at your fingertips. Getting clients is the easy part. Keeping them happy is another thing altogether. The STiLETTO platform allows you to keep your clients up to date with all aspects of their relationship with you, including customized emails with event details, recap information and in-depth reporting. It's never been easier to delight your clients. Having great staff is what sets your agency apart. You want to make sure that you reward the people that make you look great at every event. 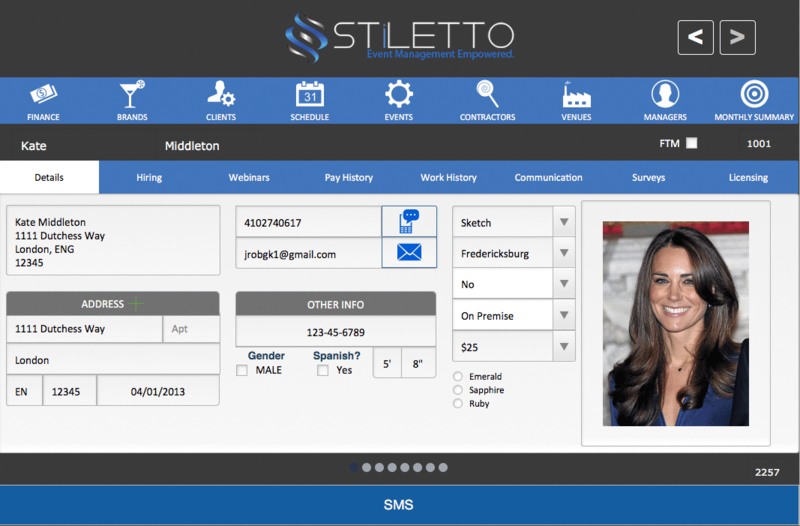 STiLETTO makes managing your staffing pipeline a breeze, with a tracking system designed to keep you up to date on the qualities of your staff, and the numbers you need to effectively cover your clients' requests. 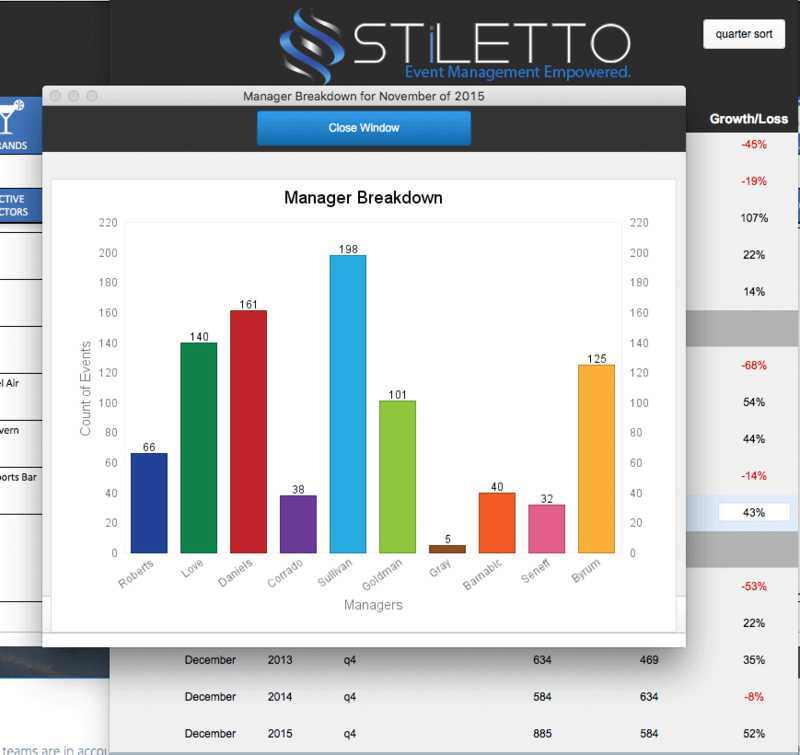 STiLETTO makes the difficult task of managing people a breeze. The difference between a good company and a great company is simply how you manage your data. 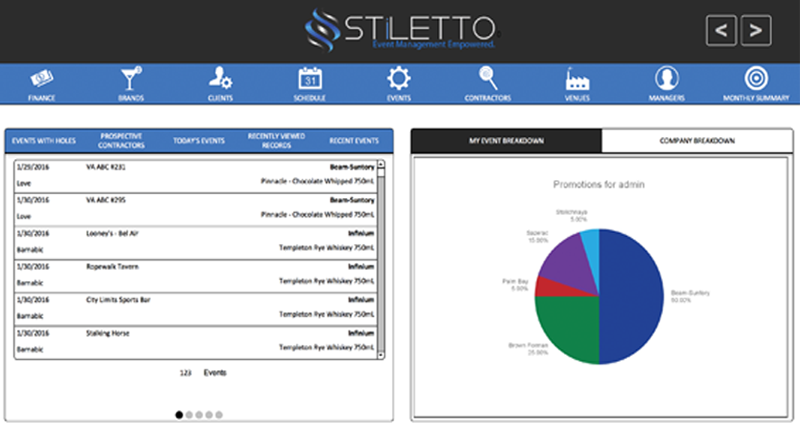 With STiLETTO, you will always have a huge library or reporting available at your fingertips. What's more, you don't need to be a computer scientist to get at data that isn't in a built in report. Want to know how many off-premise events you had at a certain venue that sold more than 12 units? With two clicks, you'll have that information for your client and for your decision making needs. Your staff is your greatest asset. They make you look good at every event, promotion, and activation. Your management tool needs to provide a quick and easy view of all of your staff, as well as their upcoming assignments, their performance, and their pay history. Need to track your staffing pipeline? STiLETTO makes that a breeze. When it comes time to pay all of your great staff, it's typically a headache to keep track of who should be paid what, and what bonuses they have earned. 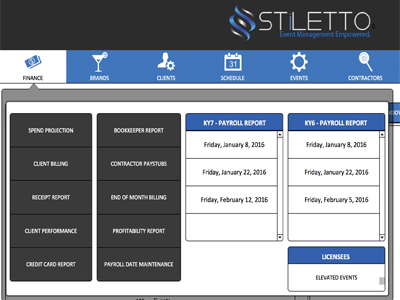 STiLETTO was designed to make your payroll smooth, fast, and AUTOMATED. With one-click paystub generation and delivery, you'll save hours when it comes to notifying your team on their compensation. Keeping your team up to date is everything. With great built in communication tools, you can send customized event contracts to each and every contractor with no additional work on your part. What's more, you can send batch text messages to check availability of staff, offer contracts, and plug in staff to open shifts. All of this, of course, with a great history and tracking system that allows you to see each SMS that is related to each event AND each contractor. Your teams are in accounts all over the city and the state. With our iOS application, you'll not only see when staff gets to accounts, you'll know when they leave. Combine that with digital reporting of bottle sales and event attendance, and you'll be saving not just time, but money when it comes to collecting data. 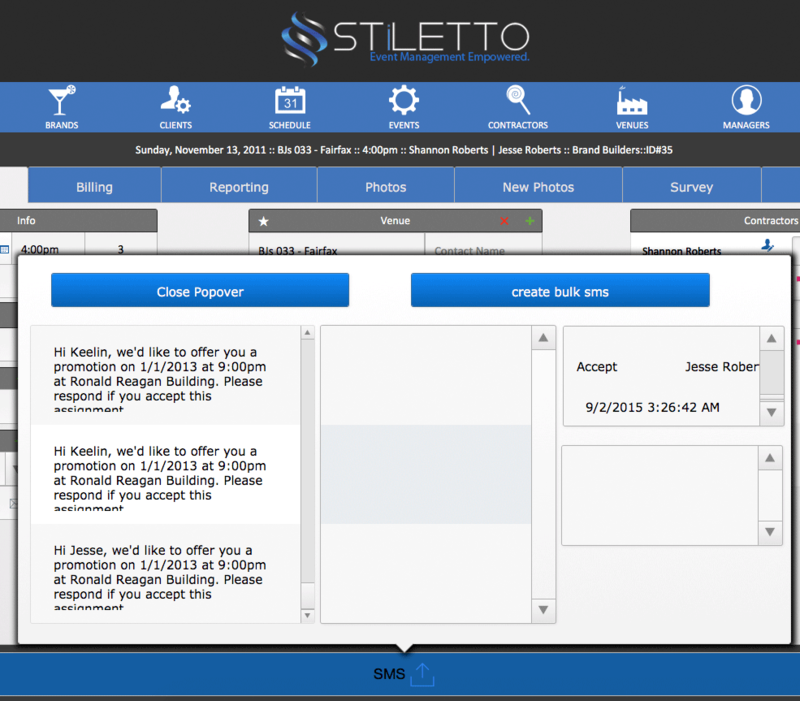 Set your contractors free by using STiLETTO mobile...included as part of the STiLETTO package.